I confess dear readers that a question has been on my mind these last several years: Why aren't more films having fun with their special effects? It may sound like a strange question to ask, but I believe it is a huge problem. Whenever a movie ages it always has the domino effect of making the movie look worse to a newer generation who don't see Superman flying, but a man being carried on strings. Yet there are classic movies like “Raiders of the Lost Arc,” “Star Wars,” and “Ghostbusters” that hold up extremely well in terms of their special effects. Oh, don't get me wrong, the effects look fake now, but look at how they are used; they are used in fun, whimsical, and downright hilarious ways. I think that the last time a movie was made with special effects that were used in such humorous and fun ways was with either “Back to the Future” or “Who Framed Roger Rabbit?,” and those movies haven't aged a day despite looking a little old. The point I'm making is that with all the CGI, animatronics, 3D formats, IMAX screens, and practical effects Hollywood can produce these days, there is no reason for so many effect laden movies to look so lifeless on screen. This is why “Ant-Man” was such a delightful surprise: It's the first movie in a long time where the visual effects seemed designed to add elements of fun into the mix, rather than just trying to pump up an action scene (though there are a few of those as well). 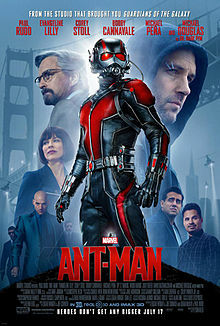 Based on one of Marvel's least known heroes, the movie is a typical superhero origin story that dutifully sets up the premise, gives us a likable character to root for, and a decent enough villain while hinting at greater foes to fight in future installments. So, yes, this is a standard Marvel movie in pretty much every respect. This might not have boded well for the film, seeing how “Avengers: Age of Ultron” raised the bar very high while still managing to keep the results extremely low. Paul Rudd plays Scott, who is in legal trouble with the law for using his computer skills to break into places and stealing things. 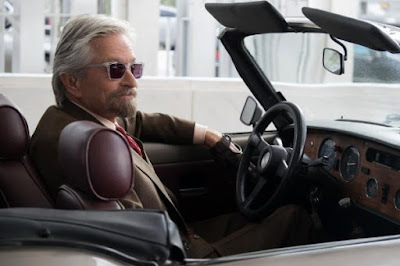 A man named Hank Pym (Michael Douglas) finds him and offers him a job, a job Scott hopes will turn his life of crime around. Too bad that job involves breaking into places and stealing things. Alright, in all fairness, Hank wants Scott to break into his old company to destroy research that has been completed that can make a suit that shrinks human beings to the size of an Ant. Hank finished the only working prototype years ago, but buried his research for fear of how it would be used if mass produced. Scott is to use that suit to help in this mission. 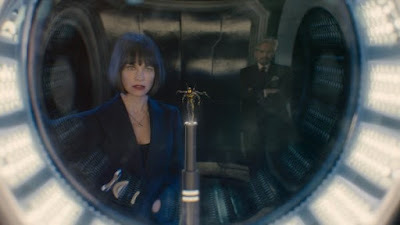 They have additional help from Hank's estranged daughter Hope (Evangeline Lily), who is such an obvious potential love interest she might as well have a neon sign over her stating “Hate me until the last ten minutes of film!” Again, this is all very typical for a Marvel film, so if I was grading this based on just the screenplay, it would be harder to recommend. Ah, but there was a reason I went into an overlong explanation of the importance of special effects that are fun though! Because in the area of special effects, this movie shines brightly. 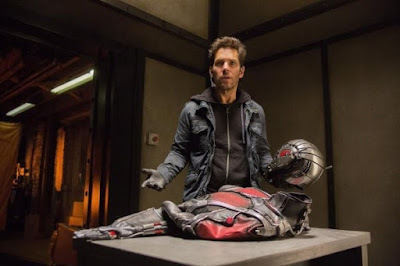 The effects of Ant-Man shrinking and growing are not only seamless, but portrayed in extremely humorous ways. 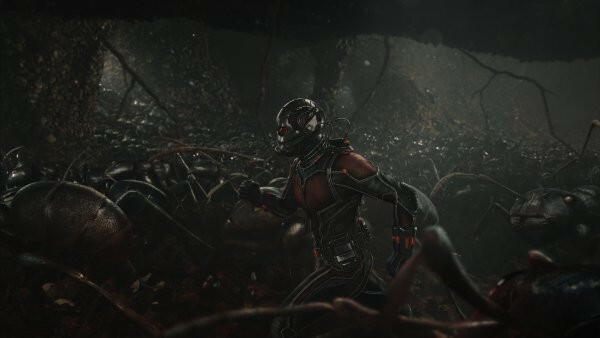 I couldn't help but smile when Ant-Man rides on a flying ant through his obstacles, and the great 3D effects highlight how scary everyday objects look from a bugs perspective. One of the biggest laughs I got was during an epic fight on a toy table, where an upcoming Thomas the Tank Engine toy looks like the scariest thing in the world (while being fairly innocent looking from a normal perspective). Rarely do you see these effect driven action scenes be so epic in such non-threatening environments! 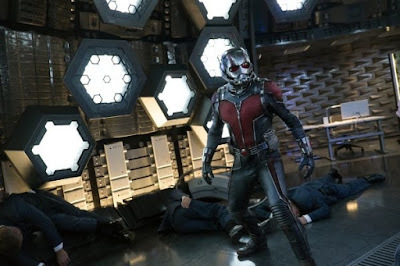 The film was originally set to be directed by Edgar Wright, before he left the project due to creative differences. Never-the-less, he still gets a screenplay credit, and there are moments where Wrights fingerprints are all over the screenplay. Would the film have been better had he been allowed the creative control he desired? I have no doubt. During these moments of inspiration you can't help but wonder what that movie could have looked like, and that makes me mad. Still, “Ant-Man” is a lot of fun in its own right. It may be a run of the mill superhero story, but you're unlikely to have seen one have this much fun since…well, since “Guardians of the Galaxy” now that I think about it. I know Marvel have their favorite characters, but the results we get out of their smaller (ho ho) characters have yielded some very interesting results, and I hope they continue to experiment with them. Parents, there is brief language and cartoonish violence. Recommended for ages 8 and up.